I’ve been thinking about Joe Brolly and I have a job in mind for him. Yes I know – you’ve been thinking about him too. But I’ve been thinking not so much about what he’s said but the attention it has got. In the past few months Joe has been on everybody’s lips. 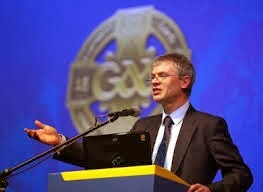 The first one – so famous even Peter Robinson made a glancing reference to it in his speech at that GAA dinner – was that rant he went into at half-time, where he damned the ‘cynicism’ of the Tyrone Gaelic football team, their manager and everyone involved with them, because one of their players had fouled an opposition player. Suspend the rightness or wrongness of his comments and reflect on the attention his words got. When who won and who lost are buried in the tip-heap of time, Joe’s words will go on resonating. The second, of course, was that “They can like it or lump it” comment. Amazing. He didn’t do a rant this time – in fact he was quite quiet-spoken on Radio Foyle. But in no time the social media as well as mainstream media were stuffed with Joe reports, Joe comments, Joe Joe Joe. So much so that Peter Robinson’s speech got lost in the heavy traffic. Then there’s that kidney donation to a colleague. A heroically selfless act – and there can’t be a person in Ireland that hasn’t thought and/or talked about it. Joe is by profession a barrister as well as a Gaelic football pundit. The job I think he should consider is setting up his own PR company. “But lots of people hate what he says!” Yes, Virginia. But nobody ignores it. Which is the holy grail of PR work. Joe Brolly has a go; Tanaiste says "Me too"